Boracay has reopened for business and many changes have been made, and many are still ongoing. It’s becoming clear to locals that things are going in the right direction and much work is being done. New water and power infrastructure is being added every day. The roads have widened and sidewalks are being installed. With all these changes have come a preliminary set of rules intended to help make all these new exciting changes more sustainable. 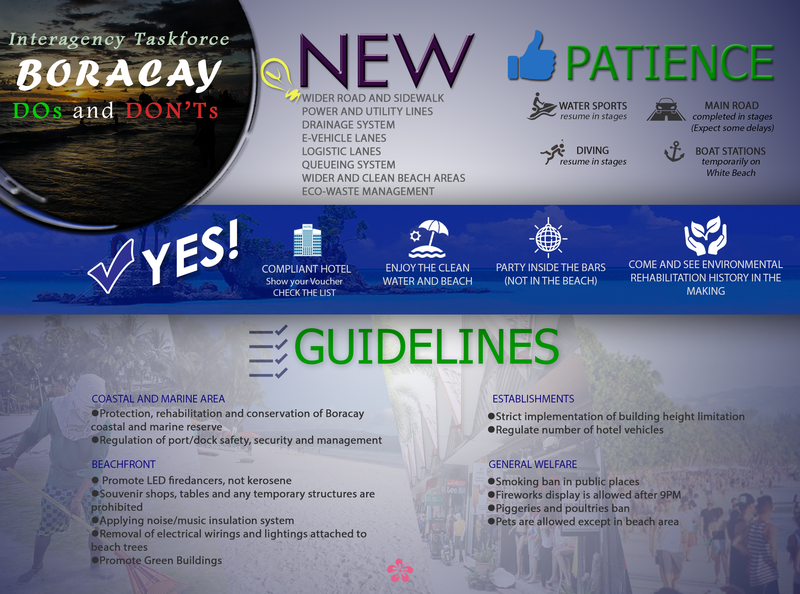 Many of these new Boracay rules apply to local businesses, but some, especially in terms of the general welfare, apply to travellers and tourists. There is a general smoking ban in public places. Smoking in these public places may incur a fine. You can usually ask your local business proprietor where it is ok to smoke. Very clearly, smokers should not smoke near places with more foot traffic, such as the white-beach beach front, D’mall and other main shopping areas. If you are bringing a pet to the island for an extended stay, note that they are no longer allowed on the front beach areas. In the days of old, parties often spilled out onto the beaches. Along with plenty of human pollution. These days, parties stay in the bars. The nightlife is still great, and you can still enjoy the beaches in the evenings while having a drink or two, just leave your drinks inside the bar/pub/club to enjoy. While some of the new rules may at first seem heavy-handed or overly controlled, especially to old hardened party travellers, this is not how it feels on the beach. Things feel very much the way they used to. People still have a great time, there is no authoritarian presence. Just a few new rules to keep our beaches kicking it into the next decade. Hi, I want to bring my family to Boracay in December, but I can’t find any link that says water sports are available on the beach, and that the restaurants are open again. What is the current situation? Thanks for your help. Hi there Michael, most watersports have reopened. Scuba, windsurfing, kiteboarding, etc. Any activities we list on our website here: https://www.myboracayguide.com/boracay-activities/ are open and ready for business. Virtually all restaurants are open. there are some new ones, and the old favorites are generally all still with us. Great dining won’t be any sort of a problem! This entry was posted on Tuesday, January 22nd, 2019	at 2:16 pm	and is filed under Recent	. You can follow any responses to this entry through the RSS 2.0	feed. You can skip to the end and leave a response. Pinging is currently not allowed.